Did Your Heater Give Up for Good? Have You Schedule AC Maintenance Yet? “I’ve never had a problem with my electrical system during a storm, so I don’t need surge protection.” If you’ve ever had this thought, we encourage you to reconsider. Surge protection protects your electronics and electrical appliances from power surges—which yes, are sometimes created by storm-like weather, but that is not always the case. In fact, it’s rarely the case. In recent decades, homeowners like yourself have become increasingly reliant on electronic devices and high-efficiency appliances. With the increase in electronics but ill-equipped electrical systems, power surges are pretty common—and these surges will slowly damage anything plugged into your electrical grid. 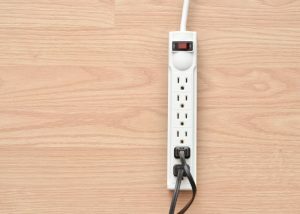 Perhaps you believe that you can just get by with the small, portable surge protectors—otherwise known as power strips—that you can find at any office supply or hardware store. After all, you can plug in your TV, stereo, computer, lighting, and more all into one place. This might seem convenient, but it’s really not offering you the level of protect your home needs. Does It Have a Circuit Board? Then it needs surge protection. Circuit boards are included in all electrical appliances and electronics, like your HVAC systems, clothes washer, dryer, entertainment equipment, and even your LED lighting. We’ve continually been increasing the use of technology, and that technology needs protection. Another thing to consider is that even if you do have the aforementioned power strips, it’s next to impossible to get every single electrical component in your home plugged into them (like your water, dryer, and HVAC units). It’s estimated that the average American home could have as much as $10,000 worth of unprotected electrical equipment without the right level of surge protection—whole house surge protection. When you think of a power surge, you might think about a huge flash of lighting, or maybe even seeing sparks flying from your outlets and light switches, and lights flickering on an off. The truth is, except for the largest of power surges, most are pretty hidden. The accumulation of mini-surges, which can occur due to things like your generator and air conditioning unit, introduces small surges to the other electronics and electrical lines in the home, and over time they can cause multiple appliances to fail. But with whole-house surge protection installed right at the circuit breaker, there’s no need to worry—your entire electrical system will be guarded. When a high-powered appliance sends a surge back to your electrical panel, it can damage the whole panel, and therefore all the systems attached to it, without the right level of protection. If you’re still unsure of whether you actually need whole-house surge protection, we urge you to give our team a call. If you’re concerned about the ability of your electrical system to handle the demands you place on it as a homeowner, there are a number of options we can discuss, from potentially rewiring to maybe even upgrading your electrical panel. At Covenant Heating and Cooling, we are “Dedicated to the Promise of Serving You.” Contact us today for exceptional electrical services in Nashville, TN.